AESSEAL has launched the patent pending EasyClean seal support system for the food, beverage, and pharmaceutical industries. The Rotherham, UK-based company claims that EasyClean is 'a unique, cost effective solution to improve hygiene standards' for those involved in food, drink and pharmaceuticals. Despite the requirements of these industries to maintain a high level of hygiene in the production lines and throughout their factories, it is frequently the case that the seal support systems harbour dirt and bacteria on the interior of the main vessel. This is due to their inherently enclosed design, which makes them difficult to inspect, clean and maintain high levels of hygiene. 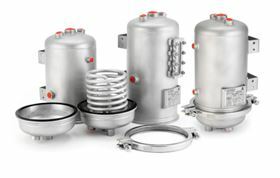 The EasyClean vessel, developed by AESSEAL, is the 'ideal solution' for industries, which require more control over the level of hygiene in their plants. EasyClean has a detachable lower section, which enables the vessel to be taken apart for inspection and cleaning. This removable lower section, offers manufacturers the opportunity to quickly inspect and clean their systems without severely impacting on costs, production or product quality, whilst also eliminating the harmful build up of dirt and bacteria. The company believesthe system leads the market in ease of use and affordability, and sets new standards in support system capabilities. 'EasyClean is both a convenient and cost effective solution allowing manufacturers to further reduce the risk of product contamination in industries where a high standard of cleanliness is essential' AESSEAL states. Like this story and want to read others similar to it? Go here tinyurl.com/mzqxupj to receive unrestricted Free access to the content on World Pumps. Joining will only take a few minutes, and you will gain access to the digital edition of the title’s magazine as well as a package of special features, news and much more.